We send our heartfelt sympathy to the families and colleagues of those who lost their lives in the horrific shooting at the Capital on June 28. Free speech is the cornerstone of our way of life. We are incredibly impressed by the grit of the Capital staff to continue reporting even while the tragedy was happening and to work overnight to "put out a damn paper." This underscores the importance of an unbiased, free press to our community and to our country. 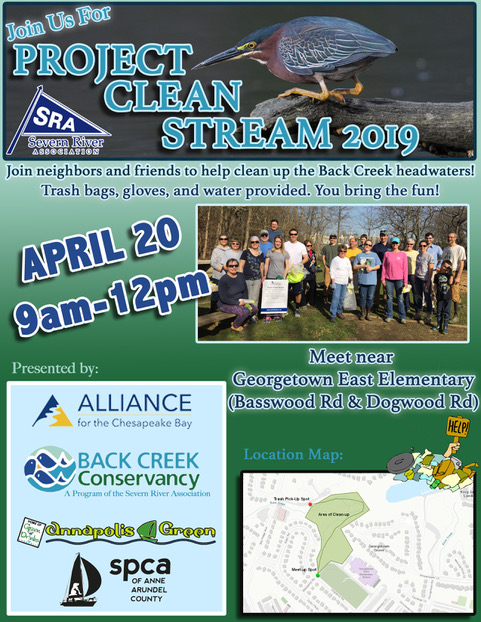 Our Vision: A greater Annapolis community that shares responsibility for a healthy environment and works together for positive change. 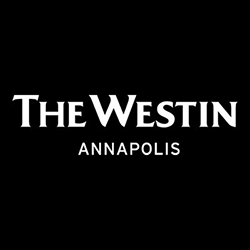 Our Mission: To connect, inform, and inspire Annapolis residents, organizations, and businesses to care for the environment, live more responsibly and create a more beautiful and thriving community. Plastic Pollution in the Chesapeake." Stay tuned for details and save the date. No where else in the area will you meet so many eco-minded people from all aspects of our environmental and business community. Come join in and see what all the buzz is about! Support our supporters! Patronize the companies that have hosted Green Drinks and sponsored our email blasts! Click to see who they are. If you're thinking of using disposables, contact us! 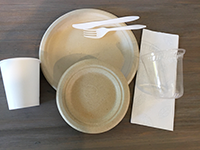 We've got compostable dishes, napkins, cups, knives, forks and spoons available for sale... a great alternative to plastic! See an environmental problem or violation in the City of Annapolis? Here's how to report it. Are you eligible for a Stormwater Management Tax Credit from Anne Arundel County? Read more. 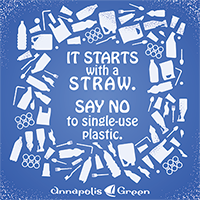 Annapolis Green is on a campaign to cut the use of throwaway plastic water bottles to protect our waterways and our health, and to save money. Read more. The NAPTOWN TAP is a new product that dispenses unlimited filtered water for fill-ups of reusable bottles and cups, thus eliminating the single-use water bottles that are so bad for the environment. To date, we've dispensed the equivalent of 5394 16.9-oz water bottles! Read more. Stay tuned for info on our next talk on Climate. Just leave them on our front porch. Click to learn more. You’ve been bringing your wine corks to us for recycling for a while now. Here’s a chance to give a gift that you yourself contributed to! It takes 198 corks to make a yoga block. For just $20 plus tax, you can make the yogis in your life feel good about their blocks since they are made from recycled materials. And really… you can make up a story about how that particular block includes the cork from that special evening’s champagne! Maybe it does! Sorry, we can’t ship. Orders are for pickup only. Buy online. A Brick in Your Honor! Due the the success of our "Start with a Stave" campaign we were able to accomplish a beautiful make-over of our interior space. Now we've shifted our focus to the outdoors to complete the garden with the installation of permeable, engravable bricks in the walkway leading to our porch. We are fortunate to have had the permeable bricks donated by the EP Henry company. Our "Buy a Brick" campaign will help us raise funds. We'll engrave your name on the brick for all to see. Read more. Our Annapolis Green House is more than just our office... The Annapolis Green House is the first Green community center of its kind in our historic town, where organizations can meet, showcase their products and services, and together build a sustainable community. And of course, it also serves as our much-needed office. With a prominent, downtown first-floor location in the shadow of the State House, our end-unit rental is welcoming and filled with character. At the intersection of Maryland Avenue and State Circle, we benefit from considerable foot traffic and proximity to city, county, and state offices. Parking is available at several garages nearby. Main Street and the US Naval Academy are a short walk away. Our Responsible Events & Festivals program helps organizations operate their special events Go Green by providing best practices including recycling, composting and measurement, and assisting with marketing, sponsorships, and resources. From sporting events to festivals, to running races, sailing regattas and more. Learn more. It won't cost you a cent! 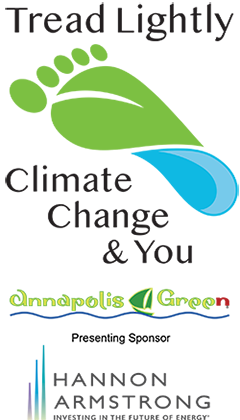 Annapolis Green is a 501(c)(3) tax-exempt charitable organization.